You’ve just touched down in Reykjavik and are completely over the moon. Finally, you’re going to take a dip in the Blue Lagoon, gawk at the Northern Lights, and witness those picturesque landscapes that your friends keep raving about. You’ve heard tales of the legendary nightlife in Iceland’s capital city, and you’ve penciled in more than a few pit stops in Reykjavik’s bars into your itinerary, too. You’re ready to party in Reykjavik! Don’t worry: Thirsty Swagman’s here to the rescue. 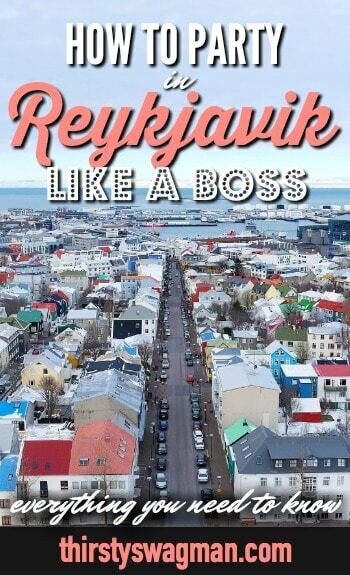 We’ll show you how to party in Reykjavik like a boss – and make sure you can save your hard-earned dough for those gorgeous glacier treks. 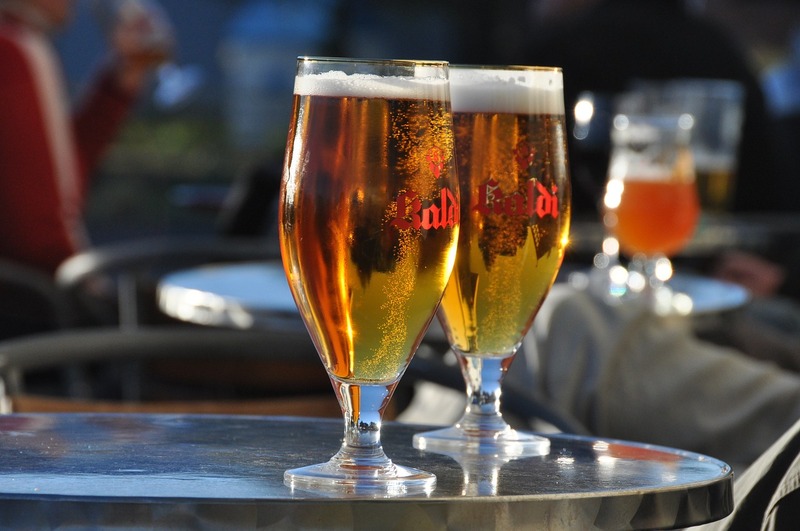 Let’s set the stage: it wasn’t legal to drink full-strength beer in Iceland until 1989. Reread that sentence. It’s not a joke. If you think about it for a hot second, you’ll realize that that’s less than thirty years ago. So how did this happen in a country that’s progressive in so many areas, from gender equality to renewable energy? In the early 1900s, Iceland was engaged in a struggle for independence from Denmark. Because the Danes drank a lot of beer, Icelanders associated this drink with their occupiers and frowned upon alcohol in general. Between the temperance and independence movements, it wasn’t surprising that Icelanders voted in favor of outlawing alcohol in a 1908 referendum. Prohibition in Iceland officially went into effect in 1915. Interestingly, it was Spain that started to swing the pendulum in the opposite direction: they threatened to stop buying fish, Iceland’s main export, if Iceland did not buy Spanish wines. In 1921, this pressure led Iceland to legalize red and rose wines from Spain and Portugal. Eventually, the ban on spirits was lifted in 1935. But beer containing more than 2.25% alcohol was still illegal in Iceland after 1935. The reasoning behind this was that beer was cheaper than spirits. If beer was so cheap, they thought, it would lead to alcohol abuse and moral corruption. As Icelanders began to travel more internationally, however, they kept encountering beer, and attitudes started to change. Finally, Iceland’s parliament voted to legalize beer, and in 1989, prohibition officially ended. In fact, March 1, 1989 is now celebrated as “Beer Day” in Iceland. That makes Icelanders hugely awesome in my book. OK, if you slept through that history class above, we won’t fault you. We know what you really want to know – what’s the real deal with the nightlife in Reykjavik today? Reykjavik nightlife centers around Laugavegur (try saying that three times fast), the city’s main shopping street. With bars in close proximity to each other – and without those pesky cover charges like you see in other large cities – it’s completely possible to create a Choose Your Own Adventure bar crawl each night. And some tourists do, of course. But to truly experience the city’s epic nightlife, you’re going to have to go out past midnight on Friday and Saturday nights and experience a rúntur. Rúntur, which means “round tour,” was a way for bored Icelandic youth to entertain themselves during the endless winter months. They’d basically drive around in circles (as one does) and socialize. In Reykjavik, however, this translates to the weekend pub crawl, where Icelanders basically cram a week’s worth of drinking into 48 hours. To add to the fun, the party doesn’t start til around midnight — and it goes well into the wee hours of the night. As in, we woke up at 7:30 AM on a Sunday for our Golden Circle tour and still saw drunk, blonde-haired men stumbling around outside our hotel. Party in Reykjavik, indeed. Think your college frat party was epic? That pales in comparison to Icelanders’ ironclad livers. You can’t win this one. As fun as the nightlife scene is, there’s no way around it: drinks in Iceland are @#$!ing expensive. Unless you’re living in a three-bedroom apartment in Manhattan’s Upper East Side with two private jets at your disposal, you’re going to encounter some serious sticker shock in Iceland. Fortunately, we’ve wrangled up some tips for saving money while you’re out and about in Reykjavik’s bars. Happy hour will be your new BFF. Visiting bars during happy hour will definitely lessen the impact on your wallet. Some of our personal favorites include Kaldi Bar, with its fantastic microbrews; Apotek, with its fancy cocktails; and Lebowski Bar, because the Dude abides. And because the party doesn’t get started until late in Reykjavik, some spots (like Húrra) have happy hours that last until 9 PM. Score! Use the Reykjavik Appy Hour app to search for deals. It’s a complete life saver. You can find it here. Stock up on drinks at Vínbúðin. Alcohol stronger than 2.25% isn’t sold in grocery stores in Iceland. Instead, you’ll have to head to Vínbúðin, which are state-owned liquor stores. Check out a list of locations and open hours of these stores here. Bring your own booze. If you’re a really ambitious boozehound, you can actually take alcohol with you in your checked bag! Check the Keflavik Airport website to see specific regulations. So there you have it, folks. Make sure to bookmark this article and refer to it before you head out to party in Reykjavik and get as smashed as a Viking in the dead of winter. You’ll thank us. Thirsty yet? Check out our Nordic Rock tour that explores some of the best places to party in the North, including Reykjavik!